Working in the world of advertising - one of the unwritten rules is that you never ackowledge competitors who customers perceive to be smaller in than your company. A good example of this is Coca Cola - which never mentions Pepsi, however Pepsi being the less established company is always mentioning Coke. It seems that Nokia has broken all of these rules and by doing so is actually implying that Apple is the more dominant company. 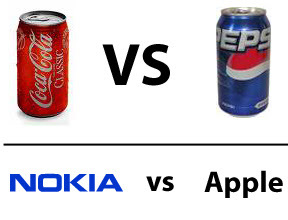 I've always been fond of Coke vs Pepsi analogies ... it's what my economics teacher always used in high school. I like Coke/Pepsi analogies too. Trotskii has hit the nail on the head there. By dignifying Apple with a response, they've relgated themselves to the challenger. Despite being "the mobile phone company" - or at least the most famous one.